In the ever-changing world of social media, more and more audiences are turning to faster forms of communication. Although Facebook remains the reigning social media platform at the time, younger audiences are turning to Snapchat for their entertainment needs. This is a perfect time to take advantage of Snapchat’s growing popularity before it becomes over- saturated with content like Facebook has. Having too many users and content floating around makes it much more difficult to be found or stand out, that is why you need to implement Snapchat into your marketing strategy now. For those who are unfamiliar with this platform, Snapchat is a mobile app that allows you to share videos and pictures with friends or with all Snapchat users. However, what makes Snapchat different than, say Twitter, is that your content disappears within 10 seconds of the person viewing them. You may wonder what the point is of sending something that will disappear within seconds, and it is a common thought. The app is popular for the very fact that content is momentary. Each photo or video sent can only be experienced once, or at least for a limited time, and that is what draws users to the platform. Instead of sharing still shots, or videos that were filmed months in advance, audiences are able to catch a glimpse of what is currently happening at your hotel. Now you may be wondering what kind of content you would share on your Snapchat. There are endless possibilities to what you can share! You can share video snippets and photos of events that are being held at your location. You can also simply share images of your hotel, available rooms, pools, the lobby, etc. Just keep in mind that one of the most important aspects of social media is implementing the human element. Avoid only sharing photos of empty rooms and hallways, share images and video of friendly staff members and happy guests! You can also share information on Snapchat through their text feature. After taking a photo or video, simply click on the “T’ icon to activate the keyboard and type your message. You can provide your audience with event updates and even exclusive deals and coupons. You can provide your followers with these Snapchat-exclusive specials as a “thank you” for following, as well as motivation for others to follow you as well. Promote your Snapchat on your other social media accounts by letting your audience know that active Snapchat followers receive exclusive deals. If you would like to take your Snapchat marketing to the next level, you can look into ordering Snapchat Geofilters. Geofilters are custom filters that audiences can use to overlay their photos and videos. 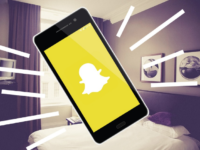 In the case for a hotel, when a user is near the location of your hotel, if they take a photo or video on Snapchat, they can scroll through the current filters and find yours. This is a great way for users to discover your business, the more people who use the filter and share their photos, the more exposure you get! Snapchat is a growing platform that reaches a wide array of audiences. As with any social media strategy, proper planning, creativity, and time is will lead to success. Try your hand at it, download the app, and start snapping!